Maybe you wonder what kind of food the Dutch like to eat. Actually the previous Dutch generation used to eat mostly potatoes (boiled or mashed) with vegetables and meat or fish (on Friday). But now a days the Dutch love to eat international food, although…they twist the food to improve the taste for the Dutch. A nice example is the typical Dutch Babi Pangang with a lot of sauce . 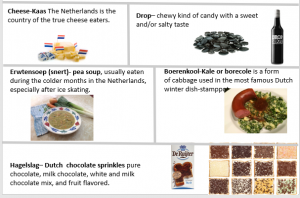 Nevertheless there are still favourite Dutch dishes and candies. http://www.connect2improve.com/wp-content/uploads/2018/06/Picture-cheese.jpg 106 183 Germa Holtus http://www.connect2improve.com/wp-content/uploads/2017/11/connect_2_improve_logo-300x103.png Germa Holtus2018-06-14 15:34:142018-06-14 16:18:06Typical Dutch Food?